Conditions listed in the Kidney/Urinary category were reported in 7.2% (84) of 1,171 surveys completed across all breeds/varieties. The incidence of serious kidney disease is noteworthy in all breeds/varieties with the exception of English Toy Terriers. Kidney disease was the leading cause of death in Manchester Terriers (UK/FCI) behind the generalized term Old Age and the second most common cause of death in Toy Manchester Terriers behind cancer. 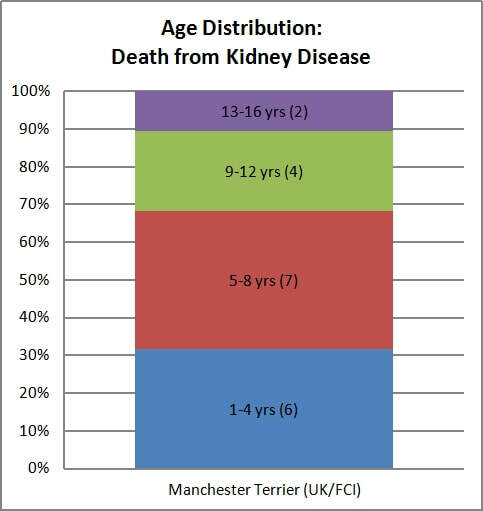 Median age at death from kidney conditions/diseases was markedly low in Manchester Terriers (UK/FCI) at just 5 years and was 9 years in Toy Manchesters. Although the number of deaths attributed to kidney disease was lower in Standard Manchesters, this variety also had a noteworthy cohort of dogs affected by serious kidney conditions at a young age. 44 dogs were affected, representing over 6% of the combined population for these three groups. Almost 2/3s of the dogs were 10 years of age or less (at death, as of the date of the survey or at diagnosis). Among affected dogs aged less than 10 years, just four of 27 were living as of the date of the survey, indicating a high degree of mortality associated with kidney issues, even when diagnosed in younger dogs. Kidney disease may be associated with other issues. Across the entire population surveyed, 12 dogs were reported with concurrent digestive and kidney issues; three with concurrent digestive issues and liver enzymes; and three with concurrent digestive and kidney issues pus elevated liver enzymes. In 2002, the most significant kidney issues reported in the combined Toy and Standard Manchester population were Amyloidosis (0.68%) and Oxalate Stones (0.78%). Chronic Renal Failure was reported in just 0.29% of dogs. In 2018, only one case Amyloidosis was reported (0.2%), 0 cases of Oxalate Stones were reported, and reports of chronic renal failure increased to 2.2% of the combined population (not including other kidney issues or reports of acute kidney failure cited in comments). Additional surveying is recommended to investigate kidney issues in the entire population, with a focus on dogs affected at less than 10 years of age and including possible concurrent conditions. Many kidney issues were not specifically attributed to a disease process but rather to general "kidney failure". Increased investigation by breeders/owners, including necropsies of deceased dogs, is highly recommended. Possible associations among diseases within the kidney category and with other conditions must be explored. It is highly recommended that information on dogs affected by kidney issues (and possibly related digestive and liver issues) be systematically collected for analysis. Central collection of diagnostic test results, pedigrees and/or DNA may be helpful in aiding future study. The most common conditions affecting Toy Manchester Terriers in the Kidney/Urinary category were Incontinence, which was reported in 2.6% (8) of Toy Manchesters and Chronic Renal Failure, which was reported in 1.6% (5). Additional conditions reported included four cases of Glomerulonephritis (1.3%), two cases of Prostate Infection (0.7%), and one case each of Amyloidosis and Xanthinuria (0.3%). a dog born with only one kidney and one uterine horn. Incontinence appears to be a condition seen most often in elderly dogs. Three owners identified age as the cause in their comments and median current age or age at death among this group was 15 years. All affected dogs were spayed or neutered and six of the eight dogs were female. Overall, nine Toy Manchester owners reported “kidney failure” (2.9%), with five cases listed as chronic renal failure, one as Amyloidosis, two noted as acute kidney failure in the comments, and one simply described as “kidney failure”. Eight of the nine dogs were deceased as of the date of the survey with a median age at death in this group of 12 years. Reporting of acute kidney failure is significant because the survey did not provide acute kidney failure as an option. In future surveys, this option should be provided as whether the disease progresses slowly or comes on acutely may provide important information. Of concern in the kidney section is the presence of a cohort of dogs seemingly affected by serious kidney disease at a relatively young age. If we consider the conditions of Amyloidosis, Chronic or Acute renal failure and Glomerulonephritis together, over 50% (8) of the 15 affected dogs were aged 5-10 years at death or as of the date of the survey (with just two dogs in this group alive at ages 5 and 9). These 16 affected dogs represent over 5% of the total Toy Manchester population survey, meaning that some 2.5% of Toy Manchesters reported on in the survey were affected by serious kidney disease before age 10. 11 Toy Manchesters were reported to have died from conditions listed in the Kidney/Urinary section, with five dogs dying of “Kidney Failure/Disease” (four non-specific and one associated with amyloidosis), two from Glomerulonephritis, one from Protein-losing Nephropathy, one from Protein-losing enteropathy with kidney failure, and one from Lyme Nephritis. Taken as a group, kidney issues were the second most common cause of death in Toy Manchesters behind cancer. Median age at death of kidney issues was 9 years, with seven of eleven dogs dying at ages 6-10. In this younger cohort, two dogs died of disease associated with protein loss at age six, one of xanthinuria (age 6), two of kidney failure/chronic renal failure at age 8, one of lyme nephritis (age 9) and one of glomerulonephritis (age 10). As was noted in the digestive section, some interplay between kidney disease and gastrointestinal and/or liver issues may have been present and might warrant additional investigation or observation. Four owners of Toy Manchesters reported dogs with concurrent kidney and digestive issues; three reported concurrent digestive issues and elevated liver enzymes; and, one reported concurrent digestive and kidney issues with elevated liver enzymes. When considering these results, please keep in mind that elevated liver enzymes was not a standard choice on the survey and collection of information on this phenomena relied wholly on owners voluntarily including it in the ‘other’ box. As a result, it is possible that more dogs may have had elevated liver enzymes concurrent with conditions listed in the survey. The possibility of a link between these conditions is further strengthened when results in other varieties are considered as a total of 12 dogs with concurrent digestive and kidney issues; three with concurrent digestive issues and elevated liver enzymes; and, three with concurrent digestive and kidney issues as well as elevated liver enzymes were identified across all breeds/varieties examined in the survey. Possible associations among diseases within the kidney category and with other conditions must be explored. It is highly recommended that information on dogs affected by kidney issues (and possibly related digestive and liver issues) by systematically collected for analysis. Central collection of diagnostic test results, pedigrees and/or DNA may be helpful in aiding future study. The most common condition affecting Standard Manchester Terriers in the Kidney/Urinary category was Chronic Renal Failure, which was reported in 3.2% (6) of Standard Manchester Terriers. Additional conditions reported included five dogs with incontinence (2.7%) and two dogs with Glomerulonephritis (1.1%). a case of Protein-losing Nephropathy diagnosed at age 8. Looking at the group of dogs reporting incontinence, while three were older (aged 12-17), two affected dogs were 7 years old as of the date of the survey. All affected dogs were spayed or neutered and three of the five dogs were female. Overall, seven Standard Manchester owners reported “kidney failure” (3.7%), with six cases listed as chronic renal failure, and one described as kidney failure associated with proteinuria and food allergies. All of these dogs were deceased as of the date of the survey (not all deaths were attributed to kidney issues) with a median age at death in this group of 12 years. Of concern in the kidney section is the presence of a cohort of dogs seemingly affected by serious kidney disease at a relatively young age. If we consider the conditions of chronic renal failure/general kidney failure and glomerulonephritis together, over 50% (5) of the nine affected dogs were aged less than 9 years old at death, as of the date of the survey or at diagnosis according to owner notes. These 9 affected dogs represent almost 5% of the total Standard Manchester population surveyed, meaning that some 2.7% of Standard Manchesters reported on in the survey were affected by serious kidney disease before age 9. Three Standard Manchesters were reported to have died from conditions listed in the Kidney/Urinary section, with all three described in the survey as Chronic Renal Failure (one of which was attributed to irritable bowel disease and drug side effects). While two of the dogs were older (aged 12 and 13 at death), one dog who died of “Stage 4 Kidney failure. Necropsy showed it was congenital” was less than one year of age at death. As was noted in the digestive section, some interplay between kidney disease and gastrointestinal and/or liver issues may have been present and might warrant additional investigation or observation. Six owners of Standard Manchesters reported dogs with concurrent kidney and digestive issues, and two more reported concurrent digestive and kidney issues with elevated liver enzymes. When considering these results, please keep in mind that elevated liver enzymes was not a standard choice on the survey and collection of information on this phenomena relied wholly on owners voluntarily including it in the ‘other’ box. As a result, it is possible that more dogs may have had elevated liver enzymes concurrent with conditions listed in the survey. The possibility of a link between these conditions is further strengthened when results in other varieties are concerned as a total of 12 dogs with concurrent digestive and kidney issues; three with concurrent digestive issues and elevated liver enzymes; and, three with concurrent digestive and kidney issues plus elevated liver enzymes were identified across all breeds/varieties examined in the survey. Looking at the group of dogs reporting incontinence, six of eight dogs were aged 11-16 at death or as of the date of the survey. All but one of the affected dogs were spayed or neutered and five of the dogs were male. In total, 19 Manchester owners reported kidney failure (4.2%). 18 of the 19 dogs were deceased as of the date of the survey with a median age at death in this group of 5 years. Just one 7-year-old dog was living with chronic renal failure/glomerulonephritis as of the date of the survey. Three owners specifically identified their dog as suffering from acute kidney failure in the comments section, which is significant because the survey did not provide acute kidney failure as an option. Four more owners reporting chronic renal failure also described extremely short illnesses. In future surveys, this acute versus chronic disease must be distinguished as whether the disease progresses slowly or comes on acutely may provide important information. Of concern in the kidney section is the presence of such a large number of dogs affected by serious kidney disease at a relatively young age. If we consider the conditions of Amyloidosis, Chronic or Acute renal failure and Glomerulonephritis together, 70% (14) of the 20 affected dogs were aged 7 years of age of younger at death or as of the date of the survey. These 20 affected dogs represent over 4% of the total Manchester population surveyed, meaning that some 3% of Manchester Terriers (UK/FCI) reported on in the survey were affected by serious (and in the case of Manchester Terriers, almost universally fatal) kidney disease before age 7. 19 Manchester Terriers (UK/FCI) were reported to have died from conditions listed in the Kidney/Urinary section, with 18 dogs dying of “Kidney Failure” (four specified as acute and three as chronic) and one from kidney failure attributed to Leishmaniasis. Taken as a group, kidney issues were the most common cause of death in Manchester Terriers where a specific disease was identified (i.e., not including the generalized term “old age”). Median age at death of kidney issues was 5 years, with 13 of 18 dogs dying at less than 7 years of age. In this younger cohort, all 13 deaths were attributed to kidney failure. Reporting of kidney-related issues was low in English Toy Terriers, with two cases each of incontinence and prostate infection (0.9%), and one case each of cystine bladder stones and struvite bladder stones (0.4%). In the ‘other’ section, owners identified one female who died of acute kidney failure at age 10. This was the only English Toy Terrier death attributed to a condition in the kidney/urinary category.